A gorilla enjoying bamboo bark in Volcanoes National Park, Rwanda. Mountain gorillas are raiding eucalyptus plantations outside Rwanda's protected area in search of sodium. 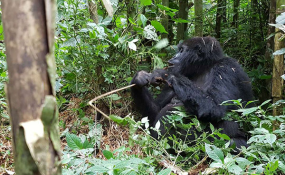 Researchers believe sodium craving is the reason endangered mountain gorillas leave protected Volcanoes National Park to raid nearby eucalyptus plantations, according to latest findings published in the Biotropica journal. University of Western Australia Biological Anthropologist Cyril Grueter said crop raiding is the main the source of conflict between local people and wildlife in the area surrounding Volcanoes National Park. "We found when gorillas exit the national park, they often head straight to eucalyptus trees that have been planted outside the park," he said. Gorillas make regular forays into nearby farms to feed, damaging vital crops. Tourists pay $1,500 for once-in-a-lifetime opportunity to spend an hour with great apes. With protection afforded by their high-earning potential, gorillas of Volcanoes National Park are thriving. Park is heralded as a conservation model. To minimise conflict, study team of researchers from Karisoke Research Centre, Volcanoes National Park and Max Planck Institute for Evolutionary Anthropology looked into what drives gorillas to leave safety of the park. Previous studies found the park's gorillas select food based on protein content and digestibility. Compared with food sources readily available in the park, eucalyptus bark scores poorly on both counts. This led Mr Grueter's team to hypothesize some other nutritional quality was drawing the gorillas. Mr Crueter's team monitored diets of 22 gorillas in three different family groups and analysed sodium content of foods they ate. Gorillas spend time to eat eucalyptus tree barks to get sodium. "Sodium deficit can cause a specific hunger for it, which causes animals to go out of their way to obtain it. Analyses showed eucalyptus are more than a hundred times richer in sodium than gorillas' staple foods inside park," said Mr Grueter. He said the team found two-thirds of sodium in gorillas' diets came from consuming eucalyptus bark from outside the park. Some gorillas braved the cold conditions of higher-altitude sub-alpine zone to feed on sodium-rich plants like giant groundsels and lobelias. All animals must maintain a certain level of sodium in their diet, and when their normal food sources fail to provide enough, many find novel ways to supplement their diet. A similar study found that the mountain gorillas of Bwindi National Park in Uganda obtain 95 per cent of sodium in their diet from dead wood, a food source with little other nutritional value. In Mount Elgon National Park, which straddles the Kenya-Uganda border, elephants are known to use their tusks to "quarry" sodium-rich rock deposits found in underground caves. Mr Grueter is convinced that sodium is the driving force behind the apes' crop raiding. He hopes this new information can be used to help minimize human-gorilla conflict.